The easyPOCKET XL features a large 75x50mm aspheric / diffractive hybrid lens that is distortion-free and extremely thin (only 3 mm). Bright illumination is provided by SMD LED technology, with bulbs that never need to be changed. 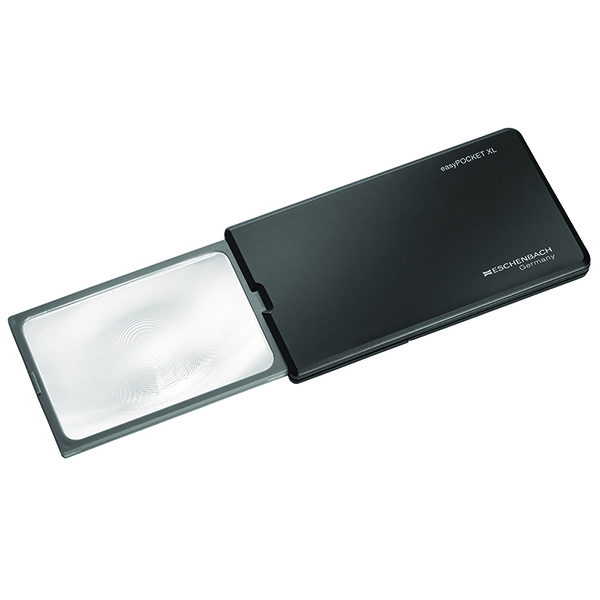 Plus, with a built-in sensor, the light conveniently goes on and off when the magnifier is opened and closed. It also includes a pull-out stand for use as a hands-free magnifier! The easyPOCKET XL lens is protected by a strong glass-fiber reinforced plastic case that minimizes scratching. Patients can choose between either a silver or black case. They are perfect for patients looking for a small, illuminated magnifier that is easy to travel with and use in restaurants and other dimly lit locations.